In just over three months’ time, as fireworks and good cheer ring in the new year, the city of Kingston upon Hull will take up the mantle of City of Culture 2017. Few specifics concerning the year’s cultural events have been made public since Hull won the bid for the title back in November 2013, so it is no surprise after such a long period of quiet, and one or two choices that ran contrary to the idea of showcasing local talent, that rumour and speculation are rife throughout the city. But this is all set to change in two days’ time, as the team behind City of Culture announce some of the larger events programmed throughout the year and detail what is to be expected in the first quarter of 2017, in a cultural season titled Made in Hull — personally, I cannot wait to see what is in store. There does, however, remain one question and it is probably the most significant question that can be asked of Hull’s ascension to the cultural throne; a question which, if left unanswered, could cause more difficulty for the city throughout 2017 than the visible scars upon the urban landscape that were caused by the downward pressure of war and the dissolution of industry throughout the mid-twentieth century. The question is this: what is the culture of Hull? And what does this culture look, feel and sound like? It is a question being asked by sceptics, on-lookers from afar, and even from within the city, amongst its artists, musicians, writers and philosophers. As someone born and raised in the East Riding of Yorkshire, with family roots and friends throughout Hull, I’ve seen the city change drastically over the past fifteen years. The commercial hubs have moved from Whitefriargate to Princess Quay, to St Stephen’s, to Newland Avenue, and soon — presumably — to Humber Street; bars, clubs and restaurants have come and gone, leaving the favourite haunts of my teenage years as nothing more than desolate streets. But beneath its grey facade, Hull’s culture has exploded in a cacophony of musical, visual and literary artists; creative agencies, film makers and tech startups are all taking hold within the city, and innovative festivals and public events are making the culture of Hull more and more accessible. This blog, The Tongue of Ullculcha, is my attempt to capture Hull’s spirit of resurgence, told from the perspective of a local artist, who is contributing to his city’ culture through musical and collaborative works. 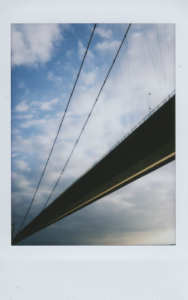 By documenting my work and interactions over the next eighteen months, it my hope that this blog will humanise the city of Hull for those unable or unwilling to visit it, and allow me to answer the big question, “What is the culture of Hull?”, for myself. To learn more about the first of my musical works to be performed in 2017, how it relates to Hull, and to discover more new music that will be coming to the city as part of the New Music Biennial 2017, visit the Performing Right Society Foundation’s website.